Hope you enjoyed the first part of the most common Google Ads mistakes because here is 8 more! Be prepared to take these bits of advice into account seriously while laughing on “money wasting hints” part. You need to understand that these tips are the crucial basis of a properly executed Google Ads campaign, so if you want to achieve cost-effective and efficient results you better start reading! #1 Keep everything in one place no matter what, especially if it works okay. Money wasting hint: You have noticed the best working keywords? Don’t bother yourself moving them into a separate campaign. What for, right? It is absolutely normal to have low-performing and high-performing keywords in your campaigns. The key rule here is to separate the most valuable ones to a new campaign. Once you have all high-performing keywords in the same place, you will gain more control over the budget. Moreover, it is much easier to collect insights about your particular campaign when all keywords perform more or less at the same level. #2 Long-tail keywords take too much time to create, so don’t waste it! Money wasting hint: There is no big difference in short-tail and long-tail keywords in terms of performance, right? After all, they are about the same thing! Bonus tip: Don’t forget about negative keywords, they will also help to reduce the amount of irrelevant traffic! #3 People click on your keywords – it works! Money wasting hint: High CTR means people are clicking and my ads are working! Let’s leave it like that then. One of the KPIs for Google Ads is CTR and that’s 100% right. But! You need to check if along with high CTR you get quality traffic to your website. First of all, check Bounce Rate, Time on Site and Page Depth as it will show you whether you drive audience interested in your product or service. But most importantly you need to check if keywords bring you conversions – as that’s the main goal, right? 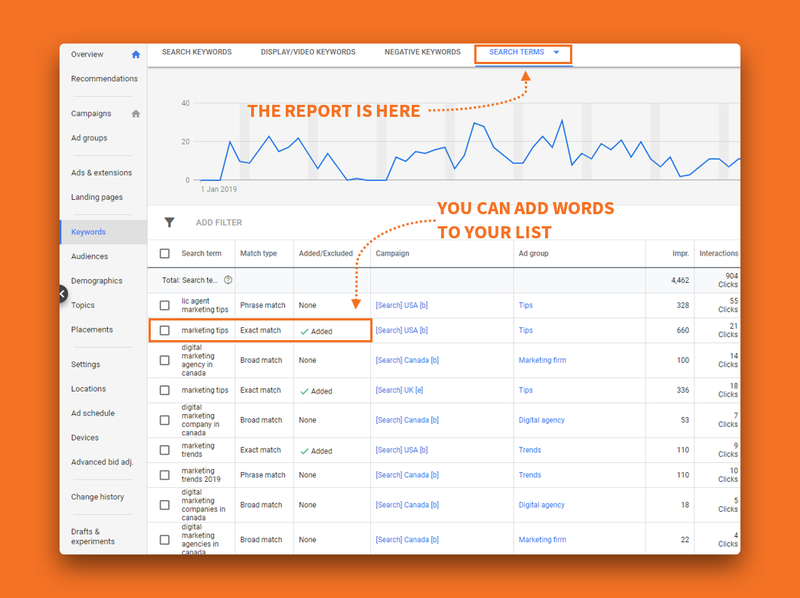 Keep track of best working keywords and get rid of low-performing ones. Money wasting hint: Even the best imagination has limits, so don’t worry if your keyword list is incomplete as it will still work somehow, right? Be sure to cover all relevant keywords related to your brand or services as it guarantees you better results. We suggest trying the Search Terms Report on Google Ads. It helps to expand a list with specific keywords or phrases from searches your ads were shown to. Look at keywords from Broad and Phrase match sections as they can be very effective and something you never thought about using before. Money wasting hint: If your campaign doesn’t show great results within the first couple of hours delete it immediately and never come back. Make sure you analyze the campaign after it was in the rotation for some decent time – at least for a couple of weeks. More or less representative results to judge Ad Copy could be achieved once the campaign got first 100 clicks. In order to optimize your conversions, you should observe your campaign for a couple of weeks and look at keywords’ performance. Keep track of all deviations in numbers – for instance, if a keyword gets many impressions and not enough clicks you should probably delete it. #6 Always lead your traffic to the main webpage – they will know what to do. Money wasting hint: Ignore the abundance of pages on your website that could be relevant to the keywords or ad copy – send your audience to the main page. With the decent persistence, they will find what they are looking for anyway! Google Ads works better if keywords are relevant to ad copies and landing pages. Always try to find the best matching webpage for every ad group. This allows you to reduce the bounce rate as a person will see expected and required content. If you create a landing page with the basic rules of UX design and put all necessary information on it, you will also increase the probability of conversion. Always keep in mind that people are not ready to browse your website endlessly trying to find the answer and use 20 seconds rule. Average time required to find any information on your webpage should be within 20 seconds because after that people will leave your website with a higher probability. #7 Don’t pay attention to your display URL – if it works that’s fine. Money wasting hint: Make sure your display URL inside the advertising works properly and that should be enough. People will click it no matter how shady it looks, right? Display URL is a visible part of your text ad that should look trustworthy and appealing to click. To assure people that the landing page has relevant content, you should create URLs with keywords inside. Even though Google now bolds keywords that match words from the query only in the body of the ad text it is still a good idea to put one in the URL to add more credibility to it. In order to improve visibility and readability of your link use camel case and hyphens. Bonus tip: You can also try to create URLs with CTA inside to engage people even more. Money wasting hint: What can be better than a great feeling of closed deadlines by Friday? Try to set up the campaign before the end of Friday and go home for the weekends with a sense of relief. Never start your campaign on Friday if you are not ready to work the whole weekends. Very often it turns out that some keywords you expected to work well are not performing at all and only wasting your money. That’s why you must carefully observe your campaign for the first 24 hours and look for low-performing keywords. Moreover, people’s online behaviour is different during the weekends and assumptions you will make based on the weekend’s data could be misleading. Besides, if something was not properly set up and it affects your day spend or avg. CPC, you couldn’t react immediately without wasting much money.